Known to most people as the titular houseguest of Takashi Miike's Visitor Q, actor Kazushi Watanabe is also quite prolific as a director. After making several short films, he embarked on a career directing music videos and commercials, all the while continuing to act in various short films (including John Williams's Midnight Spin) and founding his own film / arts festival Mount Position. In 2000, Watanabe made his debut feature. Entitled 19, the film is based on a true kidnapping case, which he had previously adapted as a short in 1996. Your film 19 is based on a true story. How much of the film is true and how much did you make up? The beginning of the film - the kidnapping of this boy by three guys - and the ending actually happened. Everything in between is fictional. How did the real story end? Were the kidnappers ever caught? It's a real story, but the victim was a friend of mine. It wasn't a case that was widely reported in the media, I heard about it from my friend. The scene where the boy kills his fellow victim is also fictional. In reality, that didn't happen. We don't know what happened to the three kidnappers. You first made this story as a short film in 1996. What did you add to it for the feature? The main structure of the story I left unchanged: three kidnappers and one victim, plus a second victim who gets killed. But because of the short running time, I couldn't put in any scenes to flesh out the characters. I especially wanted to show more about the second victim, so I did that in the feature. You won a prize at the PIA film festival with that short. Was that what eventually led to making the feature? No, it had no influence at all. Essentially, the PIA film festival is for student films. Even if you win, you're not suddenly established as a filmmaker. It's not well-known enough to make audiences come see your film. If you win a prize, you receive a small amount of money, but in practical terms it means almost nothing. You mentioned that you wanted nothing in 19 to be particularly Japanese. Why? I think there is a tendency that Japanese people generally don't watch Japanese film, even though there are many Japanese films made. I didn't want to specifically erase the Japanese elements from the film, but I wanted to lose the flavour of Japanese film, so to speak. The very uninteresting, flat images, the stereotypical acting - those things we see too often in Japanese film, so this I wanted to avoid. Is this why all the film's credits are in English, for instance? It's not that I wanted to avoid every Japanese element, I just felt that kanji wouldn't really fit very well with this particular film. So I used English. It wasn't my intention to denounce everything Japanese. After all, the film is in Japanese. Do you feel that this film has any connection with the many recent Japanese films about alienated, aimless youth? This is undoubtedly how many people will see it. It didn't really influence the film. I just wanted to make the story that I liked. I noticed that these other directors were making their films in a different way, so I didn't really pay much attention to those films. Why did you choose to play the part of the gang's leader yourself? In the short film I already played this same character, so that's one reason. Also, by playing the lead as well as directing I could get paid more (laughs). That sounds like a joke, but the other actors, even those who were non-professionals, were paid well - within the confines of the budget. I believe it's nonsense to ask someone to work on a film like this for no compensation. This character, his look and his behaviour is almost identical to the character you played in Visitor Q. Did you consciously play and style that character to resemble your role in 19? I didn't consciously try to make any references to my character in 19. But Miike-san saw my film and as a result of that he asked me to play in Visitor Q. So perhaps he directed me to play it in a similar way, because of the influence of my film. My character in Visitor Q is a guy who wants to make people happy, he is a kind of god. I just kept that in mind and since there wasn't much description about him in the screenplay, I didn't really think about other possibilities. The kidnappers don't have names in the film. Yet on your official website, they are all named after places, like Yokohama, Kobe, and Chiba. In Japan, if we have a conversation between friends, we don't really say each other's names. The closer you are to someone, the less you say each other's names. When writing the dialogue, you need a sense of reality for it to be good, so in the process of writing I deleted all the references to names. It's also true for the acting. It's like I said earlier about not wanting stereotypical acting. Especially in the case of Daijiro Kawaoka, who plays the victim Usami. He is a professional actor, so in the beginning his acting was a bit stereotyped. His expressions were exaggerated, they looked too stereotypical. I told him that it's the director's work to bring across the character's pain and his sense of shock, so it's not necessary for him to overdo it. The director can do that in the editing. So why were these characters given the names of cities, originally? It's just for practical reasons. Maybe it's better for the actors than if all of the characters are called Guy A, Guy B, and Guy C. It's a little bit easier for the actors to have some sense of a character's identity. The names are the names of regions, like Yokohama, because I thought they related to the characters in a way. I had the impression that the gang of kidnappers act as a surrogate family unit for Usami. The story even resembles a family day out: they go to the zoo, go shopping, go to the beach, take pictures everywhere. It's more a relationship of seniority than a family unit, I feel. It resembles the hierarchy in a high school student's club. But they do very natural things that maybe resemble family activities, like going to the supermarket, as you mentioned. But those kinds of situations I was really interested in, because they make the story very peculiar. For Usami, the whole situation of the kidnap is a really awful experience, but for the three guys it's just normal. That difference, the contrast between the two, I found very interesting. I'd like to talk about the scene with the dollar bill at the end of the film. You said this was actually part of the real event, but I thought that summed up very well your character's relationship with Usami: he seems kind and helpful, but in practical terms it's pretty useless. Your opinion is very interesting to me. Because in thinking about it, the fact that this really happened, I can't find a reason why he would do something like that. Because it was such an enigmatic gesture I decided to use it in the film. I didn't really want to force my opinion onto the scene or analyse its meaning. But after showing the film to different audiences, people give me their opinions of it, which are often very different from each other. I wanted to ask you for your reasons for the casting. Most of the cast are not professional actors, but aside from yourself there is Masashi Endo who is a professional. Why did you cast him? He could recently be seen in Wild Zero and Not Forgotten, in which I liked his performances quite a lot. Originally I thought about casting someone else, but this particular person had to cancel because he couldn't fit the production into his schedule. After that it was my producer who suggested Masashi Endo, so it was through circumstance that he wound up in the film. Also, the cop in the film is played by Nachi Nozawa, who is the Japanese voice actor who dubs Alain Delon and Al Pacino. Did his voice have anything to do with why you chose him? I am a fan of his voice, his way of vocal acting, and that's why I asked him. In the past I already looked him up in a directory of actors to see what he looks like. There's a big difference between the image of his voice and his actual looks, but you don't see his face that well in the film anyway. So it was for the voice, primarily. Aside from acting and directing, you also write manga. You wrote the script for a manga version of 19, I believe. Why does this story fascinate you so much that you want to tell it three times? People just asked me to write the story as a manga, so I did it. I simply made use of an opportunity I was offered. You never had the ambition to do anything in manga? I wanted to be a manga artist when I was in high school, but I didn't think I had enough talent for it, so I gave up and I decided to try film instead. But I really like manga in general, so my next film will also be published in manga form. I will write the script and I asked my favourite manga artist to do the artwork. I can't tell you his name yet, because it's still secret, but he will also design the movie poster. As a manga writer, how was it to act alongside Shungiku Uchida in Visitor Q? I like the type of manga made for guys, like Space Cobra, but Uchida-san's manga are for women or girls. It's not really my taste. So I didn't know her very well when I started Visitor Q. But we became good friends during the making of that film and since then we sometimes go see films together and hang out. When my film came out in Japan, she gave us a quote for the poster. What is it like for an actor to work with Takashi Miike? Difficult. Because I think I'm really not such a good actor, so I imagine it must have been difficult for him to direct me. Generally Miike doesn't explain so much to his actors, he sticks to a few practical directions on where to move, but the rest he will leave to the actors. You directed the trailer for Visitor Q too, is that correct? Yes, that's true. They told me I could just do it any way I liked. You founded your own festival for independent film, Mount Position. What do you want to achieve with this festival? There's no strict format or a set of rules, but we mainly concentrate on visual works. Many of my friends have a talent for something, to write or paint or make films, so it's just fun to have an event where everyone can show their work. Always working is a bit boring, so it's just to have a bit of fun. Isn't starting a film festival a strange thing to do for someone who says he doesn't watch a lot of films? I'm not a cinephile, but I like watching movies. So it's a nice occasion to watch films. If I think it's interesting, then it's fine. Whether it's an experimental 8 millimeter film or animation or anything. I think the level of knowledge of the Japanese moviegoing audience is very low. They think if Tadanobu Asano is in the cast, it must be an interesting film. But if you present a really interesting film to them and try to explain why this particular film is interesting, then they will understand. That's what I want to do, to broaden their horizons a little bit. So you're not going to be in a movie with Asano any time soon then? No, no, that's not what I mean. 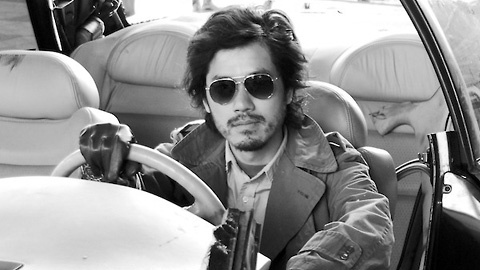 I have no problem with Asano himself or with the fact that he plays in a film at all. It's the audience's perception I'm talking about, or rather the perception of the people in the industry, who think that putting a famous name on a poster is the only way to attract an audience. But Asano and I might well do a film together in the future. In fact, the only actors in Japan now that I would really like to work with are Tadanobu Asano, Shinji Takeda, and Takeshi Kitano. You will start directing your next film soon, I believe. Can you tell us anything about it? Many people die (laughs). It's got a lot of guns and action. I believe you have contacts with a German producer now. So your next film will be an international co-production? The Japanese production side is already fixed, but I was asked by foreign producers to come up with a project. So I showed them this same project, because it's better to get more money. And the film after that is also set already. So you believe in Miike's philosophy of doing one film after another? I prefer to take some rest in between (laughs). So all this international interest is all thanks to 19 and the fact that it played at so many film festivals? Yes, of course. Especially because of the screenings at the Sarajevo Film Festival. Watching the opening credit sequence, the build-up, the rhythm of the editing, and the use of music reminded me a lot of spaghetti westerns and the films of Sergio Leone. Yes, I thought of spaghetti westerns when doing that sequence. And in one of the later scenes on the beach I asked the staff to have sand blowing around in the wind, like in Leone's films. I really like westerns a lot, Leone and Peckinpah in particular. My next film will have a kind of Wild Bunch / western feel to it, but in a sci-fi setting. A bit like Fist of the North Star. You've got two new projects lined up as a director, but do you intend to continue acting in other people's films as well? This year I really want to concentrate on making my next film. After finishing, I want to take some time off before starting the next project and during that period, if somebody asks me to be an actor in their film I'll probably do it. Because acting is much easier than directing. All you have to do is show up on the set. No need for much preparation.